Oscar Knows Incorporated has been providing services and the implementation of technologies to meet the needs of corporate and nonprofits for high impact conventional and online media since 1995. We are dedicated to empowering our clients and their communities by providing a range of services from concept, branding and corporate design to full featured e-commerce web solutions. Whether its entertainment, news, education or adventure travel Oscar Knows is here to help with all your media and portal needs. Dr. Andrea Stoll Braun maintains a full time, private practice in Menlo Park, California with a special emphasis on esthetic and restorative family dentistry. Dr. Braun is a graduate of New York University, College of Dentistry. She served her country as a Naval Dental Officer from 1982-1985 at Moffet Field Naval Air Station. Since 1995, Impink has creatively joined efforts with Oscar Braun and the team designing and maintaining websites and providing art services as needed. Impink 's current projects include the design and deployment of the CWP Legacy Project Content Management System. Impink serves the HMB Coastside Foundation as staff artist and internet administrator. John Plock is Save Our Bay's Co-Founder and chairs the Foundation Board of Directors. John is a registered Civil Engineer, is active in San Mateo County community affairs. He focuses on the protection of the Public Health and Safety. He is a member of the County's Community Development Committee and the Landfill Arbitration Committee of the Environmental Health Department. Alan Studley has been in the adventure travel and diving industry since 1978. At the beginning of Alan's career, he was a SCUBA trainer certified for all levels of Scuba. 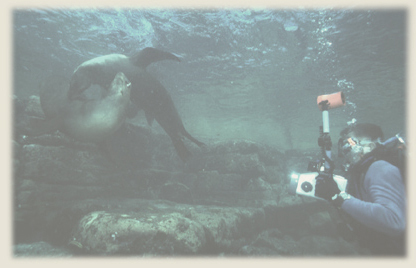 Scuba diving all over the world, Alan has been able to build his library of photographs and video, while building a strong foundation and reputation in the photography industry. Alan provided Save Our Bay with his wonderful SOB otter images as well as other significant contributions.